"'This slow cooker recipe brings people back for seconds,' writes Harold Tartar of west Palm Beach, Florida. 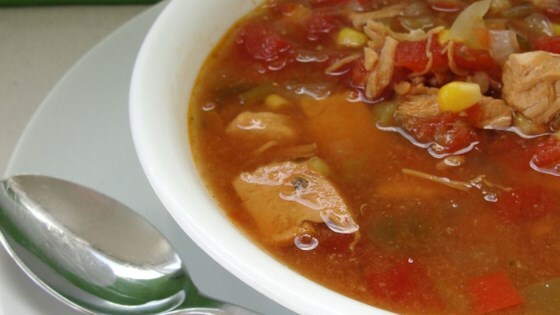 Chock-full of chicken, corn, tomatoes, peppers and chilies, the savory soup is sure to put a little zip in mealtime." In a large skillet, saute the chicken in oil until lightly browned. Transfer to a 5-qt. slow cooker with a slotted spoon. Stir in the remaining ingredients. Cover and cook on low for 7-8 hours. Stir before serving. Nutritional Analysis: One 1-cup serving (prepared with 1 tablespoon oil and reduced-sodium broth and without seasoned salt) equals 144 calories, 3 g fat (trace saturated fat), 33 mg cholesterol, 350 mg sodium, 15 g carbohydrate, 3 g fiber, 16 g protein. Diabetic Exchanges: 2 very lean meat, 1 starch. Just Ok - not enough flavor. My family suggested I delete this one from my recipe box. Very good, made with my homemade chicken broth and the cut up chicken from the whole chicken. Would make again. My husband and I found this pretty good. It does need something. I add more garlic and more stock. Might make again. Very good! I, too, used a can of Rotel instead of diced tomatoes. I also added some chili powder, red pepper flakes and used jalapenos instead of diced chiles. I love spicy!